Place bread in a small bowl, add 1/2 cup water and let soak for at least 15 minutes. Bring a medium pot filled two-thirds with water to a boil. Add cauliflower and broccoli and return to a boil, then boil for 1 minute. Immediately drain and cool vegetables under cold running water. Drain well. Wrap vegetables in a kitchen towel or paper towels to remove as much moisture as possible. Combine vegetables, egg and salt in a food processor. Squeeze bread very well to remove excess liquid and add to the processor. Pulse just until chopped but not puréed. Scoop vegetable mixture by rounded tablespoons onto the prepared baking sheet. Dampen your fingers to prevent them from sticking and form mixture into tot-shaped cylinders. Bake until browned and firm, 20 to 25 minutes. Serve warm. 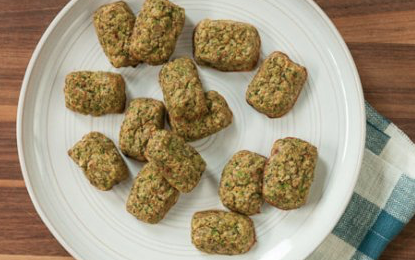 *If you prefer a wheat-free, gluten-free version of these tots you can replace the bread and water with 1 cup mashed potato−that’s about the amount you’ll get from a peeled and boiled 10-ounce Russet potato. *To replace egg with a flax substitute, combine 1 tablespoon flaxseed and 3 tablespoons water in a spice grinder and grind until thick and smooth. Let sit for 5 minutes before using. Baked tots will be a little softer inside than ones made with regular egg but will still be very tasty. Per Serving: Serving size: about 5 tots, 70 calories (15 from fat), 2g total fat, 0.5g saturated fat, 45mg cholesterol, 330mg sodium, 9g carbohydrates, (3 g dietary fiber, 2g sugar), 5g protein.